Hi all and welcome to Tuesday! Today I'm talking about a number of Dylusions products. 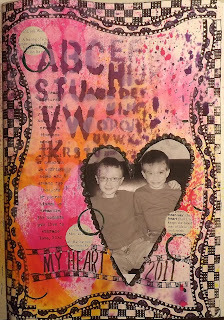 First, we have a number of new products in stock from Dyan and second...to show you my very first altered journal page! I've listed the steps that I took to create my page below. I'm using the brand spanking new Dylusions Journal to create my page (this is a must have!) and I read through Dyan's My Creative Journey before getting started. 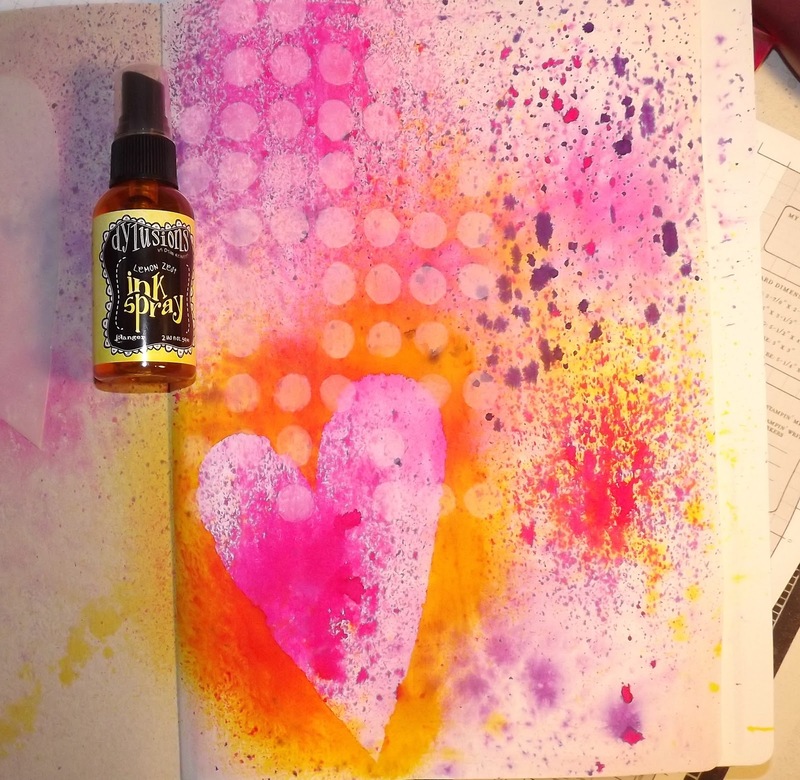 Both of these products part of this week's bundle...Purchase the Journal and receive the Creative Journey booket for 50% off retail! Use code DYAN50 when checking out and enjoy! (Note that this offer is good while supplies last. If demand continues once inventory is diminished then I'll honor pre-orders until October 22). On with the photo tutorial! This was probably my favorite step...pulling out the Dotted Flowers stencil and Picket Fence Distress Stain. 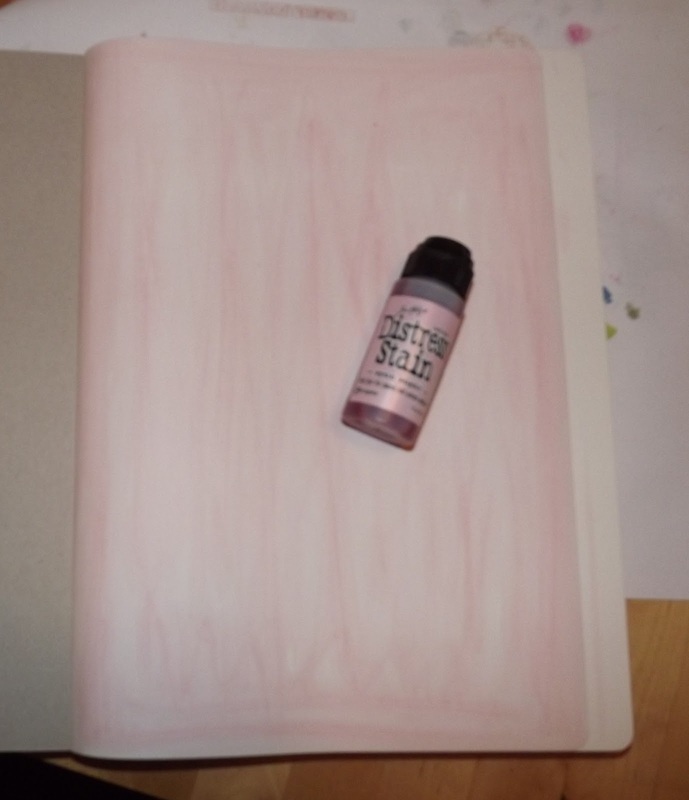 The Picket Fence stain is opague so you end up with this hint of design, with the color still showing through. Fabulous! 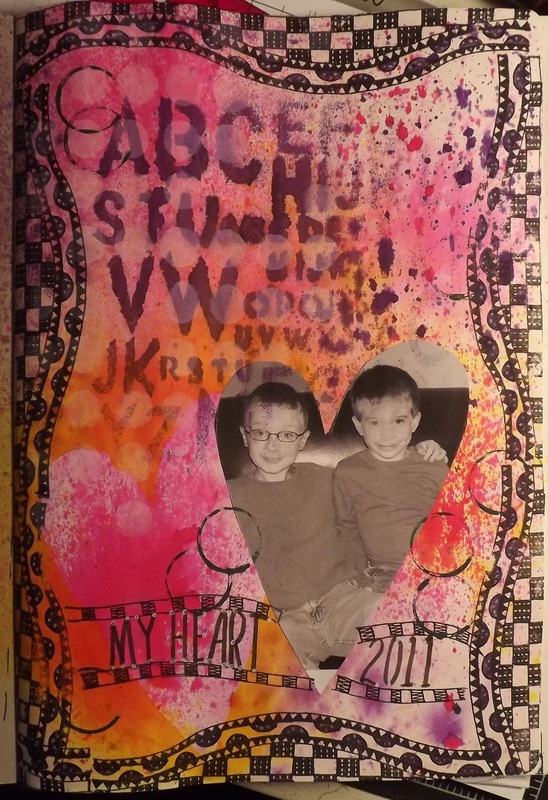 Next I used a heart template (from Studio 490) and more Lemon Zest Ink Spray to create this great heart image on the page. Dyan mentioned in her book that she loves to add frames to her pictures, like you would frame any piece of art and so I framed my page! I used the Further Around the Edge stamp set on my page. 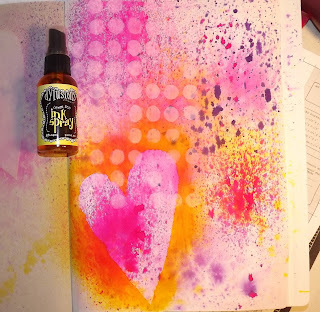 I love the contrast of the black against the light colors of the ink spray. Next...another stencil! 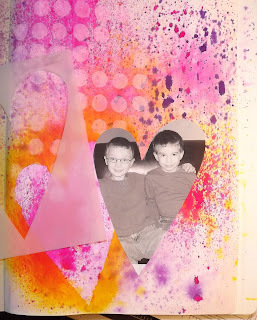 I told you I was in love with the stencils! For two young boys I had to add some ABC's! I used the Letter Jumble stencil for the letters. See those lines at the bottom of the heart picture? 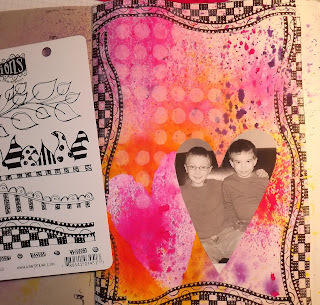 I used one of the border stamps from the set and bent it a little bit as I stamped to give my journaling box some wavy lines. Fun, right? Then...I doodled! Yup, some free hand scallops around the heart, which really made the photo stand out. 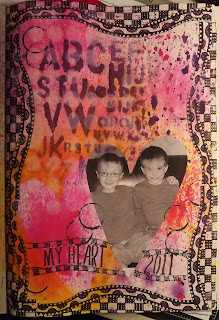 I also added a few newsprint circles and a sentiment (you can see it better in my first photo) from a Tim Holtz stamp and I was done! My first page! Yippee! I'm seriously so excited! I completely understand why people fall in love with this art form. It's so different than card making and it's really fun to just create without thinking too much about what is is you're creating. 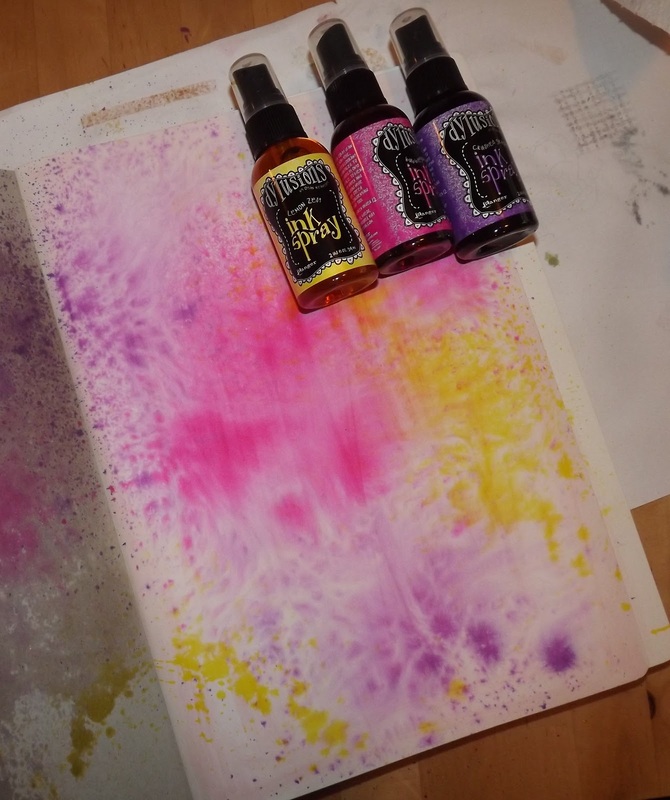 You just make art for the fun of getting your hands dirty and to see where the products and your imagination take you! the border on this is stunning. Dylusions is on my Christmas list...hope Santa is listening! 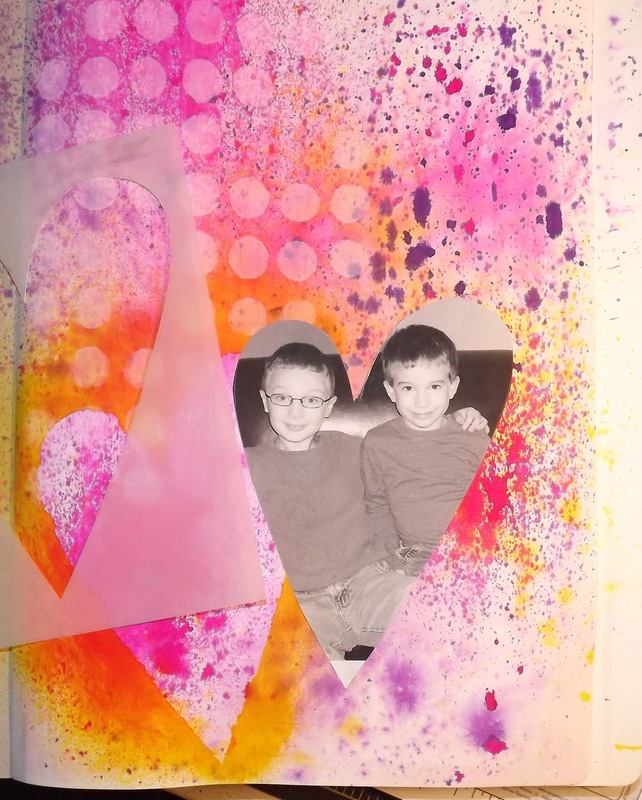 Beautiful, love the background you made and adorable little guys. This is great! All the elements really work so well. This is out of my box, too, but you've given me more courage to try it. thank you! Like your tutorial ! I can't wait to try, I just received my order of Dylusions stuff ( and I went crazy... with this order); you and other made it look so fun, I had to try! Wow! This is really cool! 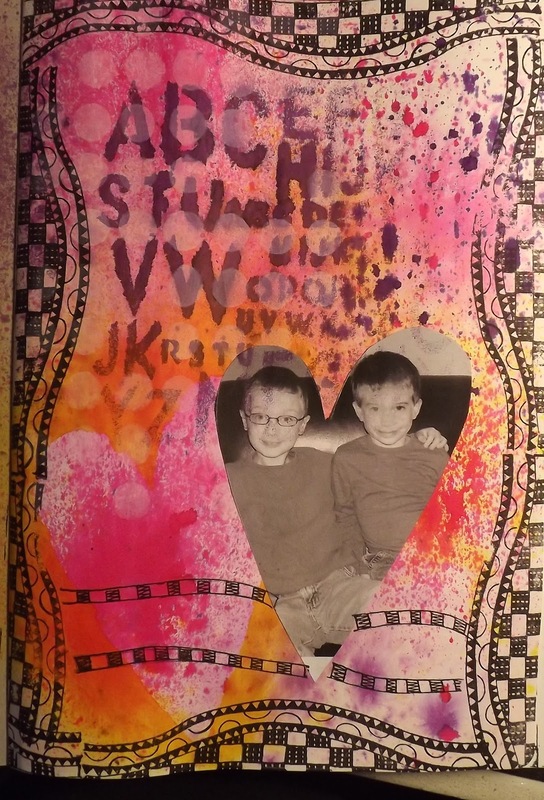 I love the journal idea, too! Not as overwhelming as a scrapbook! 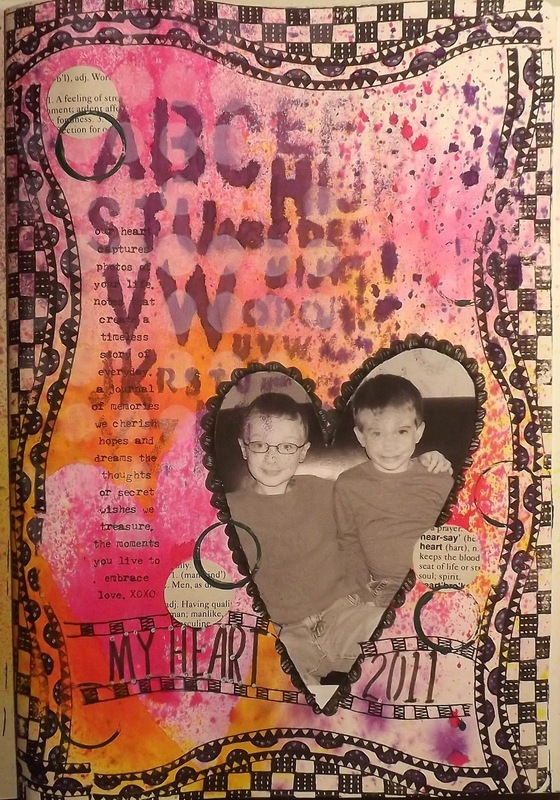 Kim, I absolutely love, love, love this journal page. You may be out of your comfort zone but I think you've stumbled on a new niche that you clearly have a talent for. 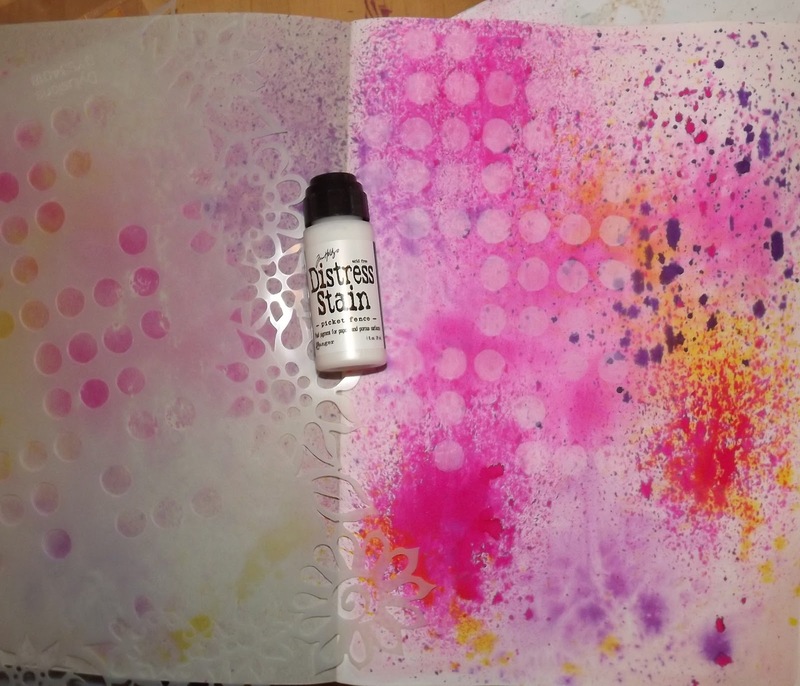 Plus, looking at this journal page and the steps in how you made it, it makes me want to buy all those supplies, which is great because hopefully others will feel that way as well.